The Quest is a Space Ghost point and click computer game made by Cartoon Network in the mid-1990s. The game is widely remembered by many people, but for a long time, the CD disk was nowhere to be found. The supposed CD disk was rumored to be on a game sampler of the same name. 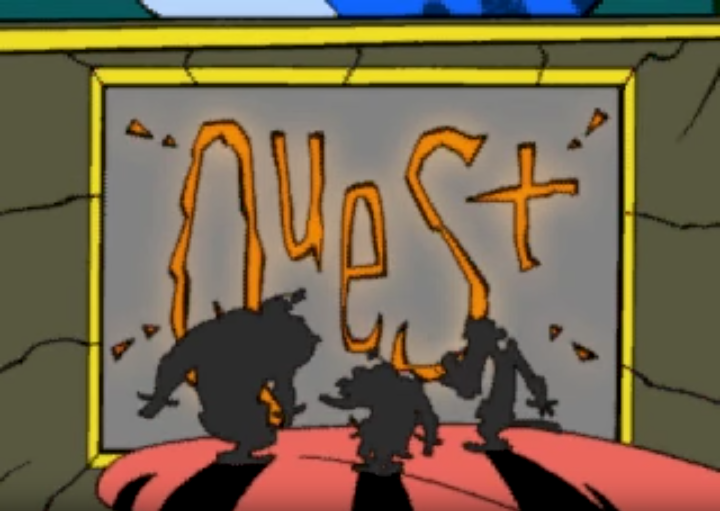 The Quest featured three cartoon characters that were teleported into an environment in which you were able to "play". There was one room in the game that allowed you to watch certain clips of Warner Bros. cartoons. One was the "Yakko's World" song from Animaniacs, and the other was an interactive episode of Space Ghost: Coast to Coast. Players were able to ask questions to Space Ghost like what his favorite foods were. He would respond with "Tacos... fajitas... chimichangas... quesadillas..." and you were also allowed to ask him what he thought of other people's affairs, making him respond with, "The Fair?! I love the fair! etc." There were different areas to go to, like a backgammon room where you play against Ramses (an Egyptian pharaoh), and another was of a Scholastic book about a girl's diary of when she grew up in Bosnia, Europe. The animation of this game had slapstick humor and had an animation style similar to Space Goofs, The Brother's Grunt, etc. Though many people remember playing this game, the CD for it is nowhere to be found. This game was first mentioned on YouTube when the intro for it was shown by timdashryan on May 21st, 2008. The game was later mentioned on Twitter by Captain B. Z. @PAXEAST. For a long time, The Quest was considered to be lost. On March 17th, 2019, Twitter user AlexMcG uploaded the entire game to MEGA, therefore making the game found.